The last chapter has been completed and the story is now over. There will be no more written in history of the life and legends of the famous Druid pack. Big Brown, 778M, the last of the direct line of Druids was killed in the Montana legal 2016 hunt in Unit 390 last week. The era of the Druids for the park has been ended through a bullet. Formed in November 2008 by four Agate Pack females and six Druid males. Their main territory is Blacktail Plateau. They were able to take this territory over after the former Leopold Pack dissolved. The first alpha pair were lead by #302M and #693F. Other collared wolves were 692F (693F’s sister from the same litter) and 642F, a younger sister. 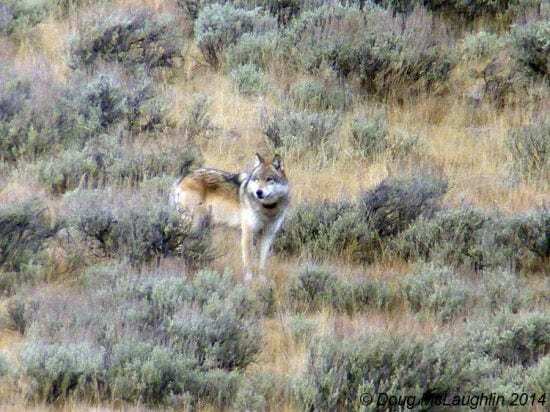 #302M died in September 2009 when he was killed by the Quadrant Mountain Pack. His nephew with the field ID “Big Brown” and now 778M became the alpha male. He and 693F the alpha pair until she was killed by suspected pack conflict. November 2008: #693F, #692F, #642F, and an uncollared female joined up with #302M and five uncollared Druid males to form the Blacktails. 693F and 302M became the Alpha pair. October 2009: #302M died, 778M became the new alpha male. Junction Butte 911M came from the Blacktail pack when he joined the JB pack. The Mighty Druids are now gone and the Blacktail Plateau pack is now gone, both with the same bullet, the same day with the same wolf, Big Brown 778M. No wolf lives forever but “Big Brown” will be remembered forever. May your spirit and bloodline carry your children forward to the greatness you are shrouded in. Ride the winds of Forever Big Brown, you are free of earths restraints. This entry was posted in News, Northern Rockies, Regional Wolves. Bookmark the permalink. Error: Error validating access token: Session has expired on Friday, 22-Mar-19 12:26:11 PDT. The current time is Sunday, 21-Apr-19 03:38:11 PDT.